This Scoreboard is dedicated to the memory and spirit of John (attom/gw) McCutchen, Proud Husband, Father, Grandfather, Greenie and a founder of the Tulane "Lunatic Fringe". He was a magnificent defender of right over wrong and a extraordinary fan, supporter and alumnus of Tulane University. A Thoroughly Thuggish Old Man was his moniker and he lived it everyday on YOGWF. McCutchen II, John Chapman John Chapman McCutchen II died at 10:45 a.m. on Wednesday, Nov. 2, 2005, in Missouri City, Texas. He was 81 and a native of California. He was a building materials retailer and a U.S. Navy veteran with the rank of lieutenant. Visitation at St. Paul's Holy Trinity Episcopal Church, New Roads, on Monday, Nov. 7, from 9 a.m. until religious service at 11 a.m., conducted by the Rev. Miller Armstrong. Entombment in False River Mausoleum. A memorial Eucharist service will be held at Church of the Epiphany, Houston, on Thursday, Nov. 10. He is survived by sons, John C. McCutchen III, San Francisco, Louis M. McCutchen, Missouri City; daughter-in-law, Elise McCutchen; and grandsons, Alexander and Sean McCutchen. He was preceded in death by his wife, Elizabeth Pourciau McCutchen; and his parents, John Chapman McCutchen and Carvelle Mercer McCutchen. Pallbearers will be Miles Brashier, Jeff David, John King, Major Hebert, David Quinn and Jim Laurent. He was a member of the Episcopal faith, the American Legion and the Democratic Party. Niland's Funeral Services, New Roads, is in charge of arrangements. Published in The Advocate on 11/6/2005. Guestbook at the above web page. Funeral arrangements are still tentative but our current plans are for him to be buried in New Roads, La on Monday with a memorial service in Houston next Thursday. Anyone is welcome to contact me for further details. My e-mail address is louis_mccutchen@isdhouston.com. Rest In Peace - John. Last edited by sr on Thu Nov 03, 2005 10:22 am, edited 2 times in total. Whay a loss. Having never met him, I still could surmise his class from his posts. I hope he was able to read our posts over the last week and it gave him some comfort in his last days. RIP Attom, you will be greatly missed. We will continue to pray for him and his loved ones. Rest in peace Mr. John. John was a great man. Back in 2003, he, JtS, and I had some phenomenal conversations about growing up in Southern Louisiana and attending Tulane through three different generations. John's contributions to civil rights and to overall social reform both in South Louisiana and elsewhere have been, are, and will always be greatly appreciated. The thing that saddens me the most is that JtS and I kept urging him to write some of his stories down for future generations to read, but none of us were able to do so. One memory that sticks out the most is the three of us in the hotel restaurant just talking, telling stories, listening to each other, and realizing what a special moment it was that we were sharing. I'm going to miss you, John. In fact I already do. John was a man of great faith, and this faith helped him greatly through the last few weeks. It's comforting to know that his pain has been eased, and he is finally going to be able to see his beloved wife Betty again. My thoughts and prayers continue to be with his family. It was a privilege to meet them, especially his two grandsons of whom John was so proud. YOGWF won't be the same without you, attom. He has fought the good fight, he has finished is work. My prayers go out to his family; his spirit and demeanor serves as a model of how all of us should behave. he was a real gentleman. and know I hear from some of these other posts that he was a loyal Democrat. Now I really miss him. Last edited by long green on Fri Nov 04, 2005 11:14 am, edited 1 time in total. meeting John briefly at the Bruno's party on June 10, 2003. I shook his hand and said a quick hello. You will be missed, John. God bless you! My prayers are with you and your family. Roll Wave...into the next life! Proud to be a Dome regular, a Fogelman fanatic, and a Turchin junkie! 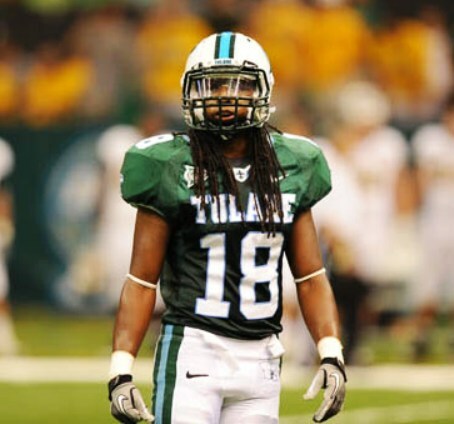 Having met Attom on YOGWF and having some email contact with him, but never meeting him in person, I can still attest to John's class and his love for Tulane. He was a Greenie through and through and will truly be missed. He was a Vetran, great Greenie, great Democrat, and I'm sure a great Father and husband. Do we send flowers or make donations to the athletic fund? John - it was my privilege. We never met in person, but I always appreciated your pm's and wisdom. Roll wave. "Not the victory but the action. Not the goal but the game. In the deed the glory." Does anyone have a pic of John that they could post? I would like to put a face with the name. And I'm sure that many here (possibly including myself) might recognize him, even if they did not meet him. Check Lady Wave's post on Attom just below this one. There is a recent picture of John and the 3 ladies. He was a great man and a great green wave fan. RIP, John. Your contributions will never be forgotten. The olive and blue is at half staff. Met him in '03 at Brunos...Condolences to his family. ...I always felt like I knew him. Great Greenie, better man. He'll be missed. 60 yrs ago, having resided in Doris Hall, Warren House and Fogelman, after small ceremony in Newcomb auditorium, I climbed aboard a streetcar, rode to the L&N station then at foot of Canal, to catch a train to the Pacific, and more importantly in the long run, began life as a TU alum and supporter. May your future be bright prosperous and long lasting, but no matter what, always support Tulane with pride and dignity. Hope this milestone is not the end of your YOGWF postings. "I got a fever...and the only prescription is more cowbell!!" That note sure choked me up. Thanks for sharing it.